Home People Brilliant and Black 16-Year-Old Isaiah Cooper Pilots a Plane Across Continental US! 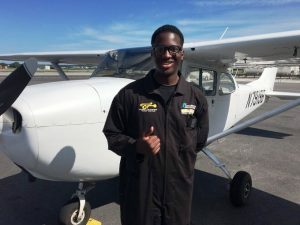 Sixteen-year-old Isaiah Cooper, a teen from Compton, has just made history as the youngest African-American to pilot an airplane around the continental U.S. FYI, the term “Continental U.S.” refers to the area of the US that is located in the continent of North America, which includes 49 of the 50 states. Isaiah’s journey took him 13 days and more than 8,000 miles to complete, and it should be noted that he did experience a bit of trouble along the way. According to ABC7.com, “while flying through Wyoming, he [Isaiah] faced extreme wind shear and was forced to land and switch planes.” But according to that station’s report, Isaiah said that quitting was never an option. The video above was actually recorded BEFORE Isaiah’s triumphant trek. To read more about his activities since he accomplished his goals, these links should get you started. Enjoy! Previous article15-Year-Old Female Pilot Sets a Record!